Heritage Junction Museum of McCloud, Inc.
During a 1981 Women's Club meeting in McCloud, one Mrs. Marty Markin wondered aloud why no museum dedicated to preserving McCloud's rich history existed in the town. As a result of that remark she ended up heading a committee of 1 person armed with a budget of $200 to investigate the possibility of creating such a museum. Subsequent planning and organizational meetings led to the incorporation of the museum on 26 January 1983. Somebody suggested Heritage Junction Museum as a name for the project, and the new museum quickly adopted the name. Finding a home was the first great challenge facing the new museum. Bill Herndon, President of the McCloud River Railroad at the time, offered to either house the museum in a spare room in the railroad's headquarters building or to donate three boxcars to the project. The museum chose the boxcar idea, which came with a stiff price: the boxcars would need at least $100,000 worth of work to be converted into an acceptable home for the museum and its growing collection. The museum started a fundraising campaign to raise the required money. However, good fortune smiled on the museum organization. With most of the timber jobs that once sustained the town gone, International Woodworkers of America- Wood Workers of America Local 3-64 voted to disband. 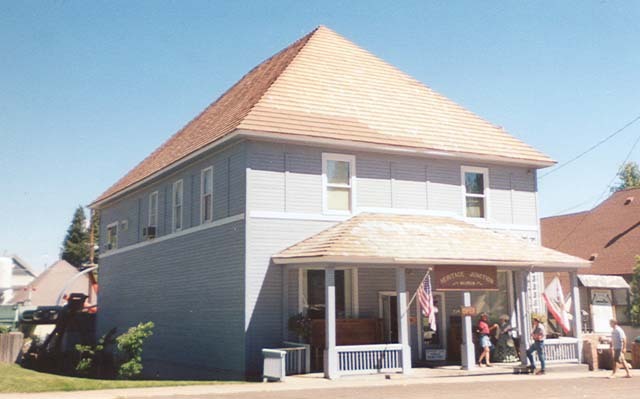 The union owned a fine two story hall located in the heart of downtown, and the union membership voted to donate the building to the museum effort. The union transferred the deed to the building to Heritage Junction Museum on 2 April 1985, with a ceremony marking the event held on 8 June 1985. The museum held its Grand Opening celebration on 19 October 1985. The McCloud River Lumber Company built the structure in 1904 for use as an employee recreation and pool hall. AFL-CIO occupied the building in 1943 and purchased it in 1964. The union leased the downstairs floor out to a series of businesses through the 1970's. Heritage Junction Museum has accumulated an impressive collection of artifacts from McCloud's history, including the giant Corliss steam engine that powered the McCloud sawmill from 1903 until 1979. The museum also has a huge photographic collection covering the entire history of the town and its surrounding country. The museum is open to visitors daily through the summer and by special arrangements during the winter months. It is very well worth the visit. Below are links to several pages of photos from the Heritage Junction Museum of McCloud, Inc. archives. All photos are from their archives unless noted, and many more photos from the museum are posted on many other pages throughout this site. Special thanks goes to the Heritage Junction Museum for allowing McCloud Rails to use their material in this project: your generosity has allowed us to fill in several gaps that existed in the coverage provided by this website. Thank you! More photos from the Heritage Junction Museum collection can be found on many pages in the Locomotive Roster, Equipment, Along the Line, and Passenger Operations sections of this site.